The UTD B Team prevailed in the Pan-Ams on tiebreaks! The 2006 Pan American chess championships were held in Washington, DC from December 27-30th at the Renaissance Hotel in the hustle and bustle of the Downtown/Chinatown neighborhoods. The location was outstanding and a contrast from many chess venues, which are too often abandoned in remote airport areas. This was the 60th annual championship to decide chess supremacy among colleges of the Western Hemisphere. In pre-1990 days, these competitions were mostly won by top tier academic schools. Many scoff at the idea that there is a link between chess and intelligence, but it certainly is interesting that of the 39 winners of this event from 1990 and before 32 of them were from what are traditionally known as elite universities. Top honors were taken by schools such as Yale, Harvard, The University of Chicago, The University of Toronto, Berkeley and MIT. Maybe intelligence is a poor choice of words. Perhaps those who are accomplished academically are also more likely to be encouraged to take up chess seriously? In the last decade, the Harvard's and Yale's of America are taking a back seat to two amazing chess programs. This is the 9th consecutive year that UTD ( University of Texas at Dallas) or UMBC ( University of Maryland Baltimore County) won the Pan-Am title. Both of these schools actively recruit top scholar/chess players from around the country and beyond. College age chess players now have the opportunity to use their chess gift as a way of paying for college. This year UTD completely dominated the event. Dressed in snappy blue blazers they had an air of confidence and organization that set them apart at all levels. Their director, Jim Stallings, has done a brilliant job of bringing it all together and sets the bar of excellence other schools can aspire too. Between the A and B teams, UTD played 48 games and did not lose a single one! This shows the level of determination the UTD players brought to this event. The UTD B team actually won the event on tiebreaks over the A team, proving UTD's remarkable depth. Theoretically, the A team could have fielded an even higher rated team, but coach Rade Milovanovic decided to balance the team rating averages to just over 2500 each. Jim Stallings said, "The idea behind Coach Milovanovic's strategy was to increase our chances of success by having equal teams. Sometimes one or two games can go awry in a team competition and result in a draw or even a loss. So, either team was designed to break through." Both teams scored an amazing 5.5-.5, a full 1.5 points ahead of UMBC A, Miami Dade, University of Peru and Duke University. For the "B" team to prevail is not without precedent as in 2002, UMBC B accomplished the same feat. In the last round match between rivals UMBC and UTD "A" GM Magesh Panchanathan won a nice tactical game against Bruci Lopez. 26.Rf1? was a tactical mistake- the simple Rg4 was much better. 26....c4! is a crushing response, because the logical 27. cd4 fails to fxg3! when the discovered attack on the h6 queen with 28.Nf7 no longer works due to Rxf7! 29.Qxh6 Bxd4+ 30. Rf2 (Kh1 Rxf1#) Rxf2 31. hg3 Rf6+ 32.Kh1 Rxh6#. The UTD B team was comprised of FM Marko Zivanic, IM Davorin Kuljasevic, IM Dmitry Schneider, FM Amon Simutowe and IM Jacek Stopa. The UTD A team was comprised of GM Alejandro Ramirez , GM Magesh Panchanathan, IM Drasko Boskovic, IM elect John Bartholomew and FM Igor Schneider. IM Rado Milovanovic coaches the team. Great Job guys! 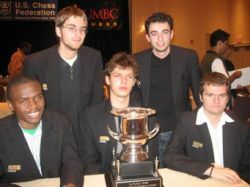 UTD A Team- Left to Right: Igor Schneider, Alejandro Ramirez, Drasko Boskovic, John Bartholomew and Magesh Panchanathan. The top four finishing America teams will meet in March to compete in the final 4. UTD, UMBC, Miami Dade and Duke will make the trip this year, the same exact teams as last year. Duke is led by IM Lev Milman(2503) who has two GM norms. He won with a nice tactical flourish against Haoyuan Wang (2360) from Yale. The Pan-Ams this year , hosted by UMBC was a chess festival. There were events for spectators and players of all ages. Alan Sherman, the director of the UMBC chess program, organized the festivities. Alan is well known in college chess circles for his meticulous attention to detail leaving very little to chance. The event began with an exhibition match featuring two college students, IM Dmitry Schneider (UTD) and Lev Milman (Duke) and two star players, U.S. Champion Alexander Onischuk and GM Jaan Ehvlest. These single elimination knockouts (10 minutes plus two second increment) were played in a very attractive auditorium used throughout the event for live commentary by Senior Master William Morrison of Baltimore and myself. The unique feature of this set-up was that the players could hear the commentary while they were playing. William and I were hesitant somewhat during the first games to be too particular but as the games wore on we offered more and more specifics and the crowd gathered seemed to really enjoy the show. All the games were very hard fought and exciting to follow. In the first round, IM Milman played White against Alexander Onischuk in the exchange variation of the Ruy Lopez. At first it appeared that Milman was better but Onischuk got active and won a very nice game. GM Ehlvest seemed to get difficult positions against Dmitry Schneider but somehow outplayed his less experienced opponent when it mattered most. Onischuk-Ehlvest was a very exciting final match. The first game was a hard fought draw where the players mildly disagreed over who was better in the quick interview post mortem at the end of the match. It seemed that GM Onischuk was better but GM Ehlvest pointed out convincingly he was really never in trouble. The final match was a barnburner where near the end both sides had the opposing kings in attractive rook and knight mating nets but neither side could pull it off. Morrison and myself by this time had let our hair down and were openly trying to announce mates to the crowd. The position was in complete chaos as GM Ehlvest ran out of time. GM Onischuk was declared the winner and received the $1,000 first prize check. Ehlvest received $500 while Schneider and Milman each got $250. The blitz event was very exciting. I just wandered through briefly but managed to see something I had never seen before at this level. Occasionally you will see very young children do things that are inexplicable like for example refuse to accept a resignation! But adults? And against GMs? I just happened to come upon a blitz game being played on the top board by GM Alejandro Ramirez of Costa Rica who represents UTD. Having been outplayed by a much lesser rated opponent (anything can happen in blitz) GM Ramirez was down a rook and his position was crumbling as each move went by. . He moved his rook to b6 and realized his opponent could skewer him. GM Ramirez offered his hand in resignation but his opponent seemed unaware of the offer and decided to play on! I have never seen anyone turn down a GM's resignation! To make matters worse the opponent overlooked the skewer and within a move or so had dropped all his material advantage and the game was declared drawn: Twenty extremely entertaining seconds of chess. IM Stanislav Smetankin won a closed event limited to those associated with the Pan-Ams. There was also a scholastic event which had a four-year scholarship to UMBC attached to it. This is quite incredible to be able to play a chess tournament as a high school student with a prize valued over 70,000$! Adithya Balasubramanian upset Raja Panjwani of Kitchener, Ontario to win first prize. During each round William Morrison and I offered analysis of the current top games. Players, coaches, parents and fans of all levels would offer insight and wander in and out. It was interesting to note that GM Alexander Onischuk would describe most positions with an "I don't know" attitude. He saw so many possibilities for both sides while very low amateur level players would likely have very determined opinions about many positions. I think there is a lesson here for all of us! For more games, complete results and other details, go to monroi.com or the official Pan-Am site on the UMBC website.